AS YOU KNOW, yesterday three people in the newsroom were laid off. The layoffs were a business decision made by Denver Post management and were conducted according to the contract. Also, 11 people have been laid off in non-newsroom positions over the last couple of weeks, and more layoffs are expected there. The last layoffs in the newsroom were conducted in the early 1980s. If you have questions, please talk to a Guild representative. Michael Roberts at Westword wrote a piece on it — Penny Parker, Mike Littwin laid off at Denver Post: More changes coming? 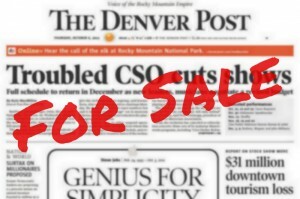 — and ColoradoPols.com has More Layoffs Hit Declining Denver Post. Bear in mind that neither source has any insight into Denver Post management decisions. Leave a comment below, if you’d like. Update: A fourth person, part time copy editor Lorrie Guttman, was laid off yesterday as well. This certainly diminishes us as a newsroom, but that may not mean as much to those focused on bean-counting. The fact that new upper management undertakes to eliminate one of five reporter positions at YourHub and one of our community managers reflects how little they understand about the volume of work already shouldered by an understaffed division supposed integral to the future of the Post. Drawing a line through names of employees isn’t exactly outside-the-box thinking, especially when it’s been done time and again – the corporate geniuses at the Scripps Corporation were a prime example of that when they put the Rocky down. Diminishing the quality of your product – and the quantity as well – is no answer to any fiscal problems. One wonders if the union folks will question how much new upper management-level salaries we’re now supposed to support at the Post, and how much that is playing into the cost-cutting in the newsroom and other departments being mandated. What are the 11 positions that were let go outside of the newsroom? There were five in Finance, all of circulation accounting, one collector and the AP person. I know there were 3 people on seven that helped with the dispatch duties and 2 out at Washington. The folks whose newsroom careers were wrecked in 2007 and 2009 beg to differ.